Join band families, friends, and community supporters in celebrating a successful year of music in a beautiful outdoor setting! This year our event will be held at the beautiful Allegretto Vineyard and Resort in Paso Robles. 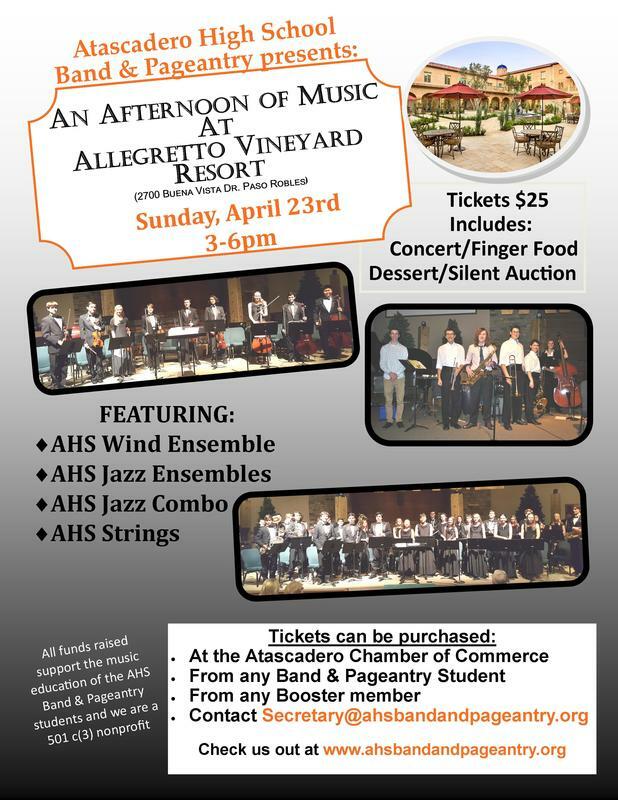 This event showcases the Atascadero Wind Ensemble, Jazz Ensembles, Jazz Combo and String Orchestra. There will be a silent auction with quality items donated by local businesses and band families. Catered finger foods and desserts are offered. There is a no host beverage bar with a variety of non-alcoholic beverages along with wine and beer. We will be raffling off this year's custom built guitar and there will be "UNIQUE" items created from "VINTAGE" band uniforms for sale. ​In this time of reduced school funding, it is vital that the AHS Boosters raise funds to support the band and pageantry programs. Each year the Boosters must raise over $40,000 in order to maintain the level of excellence in music education. It is with the help of donations from the generous members of our community and members of the band family that the Boosters are able to accomplish this large task. We Thank you for your support! ​Atascadero High School Band and Pageantry programs. Click here to download a Donor Form.